A mental institution is the setting for Ken Kesey's 1962 parable about the power of the state. Stars: Jack Nicholson, Louise Fletcher, William Redfield, Brad Dourif, Will Sampson, Danny DeVito, Scatman Crothers, Christopher Lloyd. A mental institution is the setting for Ken Kesey’s 1962 parable about the power of the state. Randle P. McMurphy (Nicholson), a bright and impetuous jailbird, feigns lunacy and gets himself transferred to a state hospital, where, he hopes, living conditions will be more to his liking. He is assigned to a minimum security ward that is presided over by Nurse Ratched (Louise Fletcher), whose lust to dominate makes her approximately as mad as her charges and whose effect on them is anything but therapeutic. 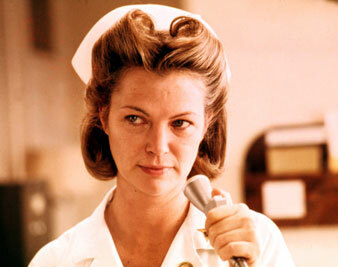 McMurphy, a sworn rebel against authority and a powerful hater of bullies, declares war on Nurse Ratched. He wins a number of hilarious skirmishes (small wonder that the book and play have been so successful), but in the end they cost him his life. My impulse is to call One Flew Over the Cuckoo’s Nest a most engaging fairy tale, with the salt of horror not uncommon in the genre. It is hard otherwise to accept the exceedingly bizarre career of inmate McMurphy. He is, in the first place, a marvelously successful healer of damaged minds, penetrating with faultless dexterity the surface foibles of his companions to find the hidden cores of sanity. Beyond that, the security procedures of the hospital are so excessively lax that McMurphy can hijack a busload of inmates, take them on an all-day ocean fishing trip and bring them home, happy, unharmed and displaying a bumper catch. When he decides to set the stage for his own departure to Canada, he has only to borrow the key to a window grating and in come a couple of willing girls (summoned by him on the office phone), armed with a case of mixed liquors and ready for love. The resulting saturnalia, with the hi-fl blasting at full volume and drunken eccentrics dancing through the corridors at three o’clock in the morning, passes unnoticed by the custodial staff and has a generally excellent effect on the revelers. A fairy tale scene, surely, but that brings me to the somewhat enigmatic position of Dr. Dean Brooks in this whole affair. Dr. Brooks is the superintendent of the Oregon State Hospital at Salem, where the film was made. Not only did he make his facilities available for shooting the picture, with members of the staff serving as technical consultants and a great many of the patients on the payroll as background actors, but he himself plays Dr. Spivey, the fictional hospital superintendent, a man of good will whose innocence (probably reinforced by laziness) traps him into thinking Ratched the finest nurse on his staff and McMurphy’s manifestly phony nuttiness a possibly genuine mania. Presumably Dr. Brooks was not seduced by visions of a film career (in fact, he is a rather colorless actor), so he must have been willing to let his institution become associated in the public mind with indifference, stupidity and terrible cruelty in the care of the mentally sick because he thinks those conditions so prevalent that they must at any cost be advertised though the medium of a highly romantic and potentially very popular film. In short, that what Ratched is meant to represent (and Louise Fletcher plays her with, blood-chilling credibility) is real. But on this, you might say, social ground, One Flew Over the Cuckoo’s Nest (or at least the film version) is less than satisfactory. Forman’s superb dance of fools, led by the superb Nicholson in the guise of the far from foolish but fatally overconfident McMurphy, leads to nothing beyond its immediate and entirely justifiable goal of superior crowd pleaser. It’s impossible not to whoop it up for the Cuckoo’s Nest while watching it, but afterwards, what is one to think? Our mental hospitals may well be callous custodial barracks for social misfits, but this movie centers on a certifiable monster, and the case is too extreme to exemplify the problem. Indeed, except for her, this looks to be a decent, useful hospital. True, McMurphy is subjected to a lobotomy, but the story is set some years back when lobotomies still had some clinical respectability as a way to control violent behavior, and McMurphy had come within seconds of strangling Ratched to death. And when you try to apply the film as a tract denouncing the general state of contemporary mental care, you come up against the fairy tale details and realize that this case will never stand up in court. Ratched is a witch and her patients are babes in the woods: you can’t use that to attack the serious shortcomings of our hospitals for the mentally sick. It is also being said that, “on another level,” One Flew Over the Cuckoo’s Nest symbolizes the struggle of the individual against “the system.” Maybe so, but the same can be said of Romeo and Juliet, David Copperfield and Alice in Wonderland. The conflict between man and society is primal, and it is almost a tautology to say that a work of fiction symbolizes it. So, although I’m left a bit puzzled as to Dr. Brooks’s motives, I’ve decided that I enjoyed the picture because it is an action romance, worked out in wonderfully inventive detail and presented with mesmeric immediacy by one of the screen’s most resourceful directors, who on this occasion had not only a smart and energetic cast but also ideal working conditions for his project. As a final example of entertainment pleasures, in the friendship between McMurphy and Chief Bromden (Will Sampson), a gigantic “deaf-and-dumb” Indian with the ears of a lynx and the poetic fatalism so often ascribed to his race, Cuckoo’s Nest offers the most appealing instance of manly love since Steinbeck broke our hearts with the similarly incongruous George and Lennie in Of Mice and Men. Sampson, by the way, is not a professional actor but a painter, vice president of the Oklahoma Art Guild and a teacher and lecturer. If anyone could steal a scene from Jack Nicholson, Sampson is the man. But I don’t really believe anyone could.